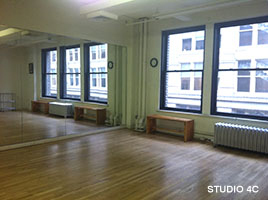 RENTAL SPACES NYC FOR FILM SHOOTS, REHEARSALS, AUDITIONS, PHOTO SHOOTS - call us for the best rates in town! ABOUT STUDIO RENTALS: Our beautiful facilities are available for private parties, dance rehearsals, play readings and rehearsals, small meetings, singing and acting lessons, film and photo shoots, auditions, practice space, dance instruction, etc. Availability includes small to large individual rooms. We also have the ability to combine spaces to create larger rooms, up to a 3500 sq ft ballroom. Most availability exists Monday through Friday from 10am to 6pm but many other options exist. Please call us to inquire about availability for your specific needs at 212-807-0802. Facilities feature beautiful hardwood floors, mirrors, sound systems, and cafe tables and chairs. A piano is also available on the 5th floor at an additional fee. 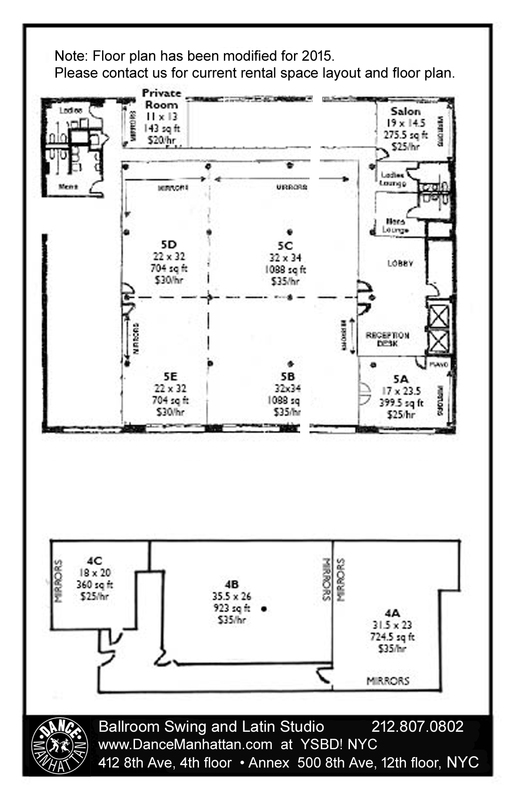 See Floor Plans to the right and call the studio to ask about availability. SPACE RENTAL NYC - Long & Short Term Availability: Whether you're looking for studio space by the hour or for long term, recurring rehearsals, simply call us at 212-807-0802 to discuss your needs. Everyone is welcome - just call! 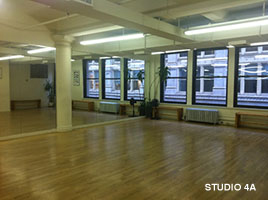 Rental Space is available at Dance Manhattan Studios. Our facilities are centrally located and easily accessible by subway, bus, bike or on foot! 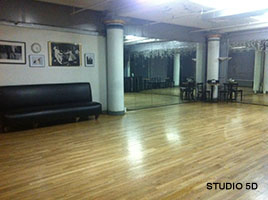 Dance Manhattan is the ideal rental space in NYC for dance rehearsals, play readings & rehearsals and small meetings, singing & acting lessons. A piano is available for the 5th floor spaces and all studio spaces have hardwood floors and mirrors. Film shoots in NYC and photo shoots, auditions, practice space, and dance instruction also find the clean, well light spaces perfect for production. Large windos and natural daylight provide full spectrum lighting advantages. We are conveniently located in the heart of Chelsea. The full range of private lessons, group classes (singles and couples classes) at all levels, one-day crash courses and workshops, and introductory packages provide students with options for starting and continuing lessons in any style dance. Popular dance events at our studio include Tango Mondays, West Coast Wednesdays, Theme Fridays and Salsa Sundays. Students are prepared to have fun at casual evenings out, special events, or even their own weddings. As you can see from the photos above, Dance Manhattan is the ideal rental space in NYC for dance rehearsals, play readings & theater rehearsals, small meetings, singing & acting lessons, film shoot space & photo shoot space in NYC, auditions, practice space, and dance instruction. 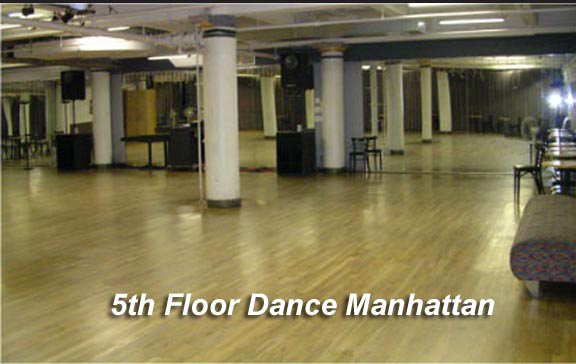 Dance Manhattan New York ballroom dance studios is also the ideal place to take dance lessons in NYC, where instructors teach Salsa Classes in NYC, Ballroom Dance Classes, Swing and Argentine Tango Classes & Lessons. Wedding "First Dance" Lessons are a special offering we are known for. We are centrally located in the heart of Chelsea and easily accessible by subway, bus, bike or on foot!